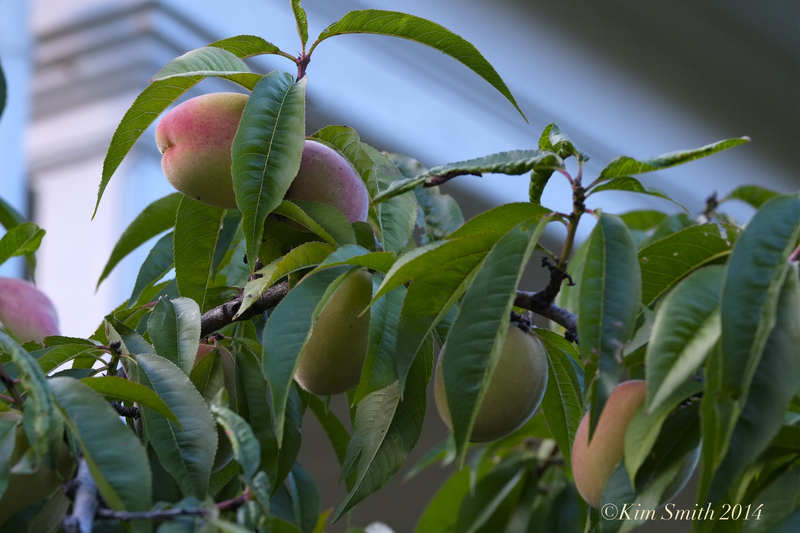 PEACHES RIPENING IN THE WARM SUN ~ DO I HEAR BELLINIS, ANYONE? Bellinis would make a festive addition to your Labor Day/Schooner Festival weekend brunch or dinner, especially at this time of year when the farmer’s markets and grocer’s shelves are brimming with tree-ripened fresh fruit. Our ‘Belle of Georgia’ white-flesh peach tree never disappoints. 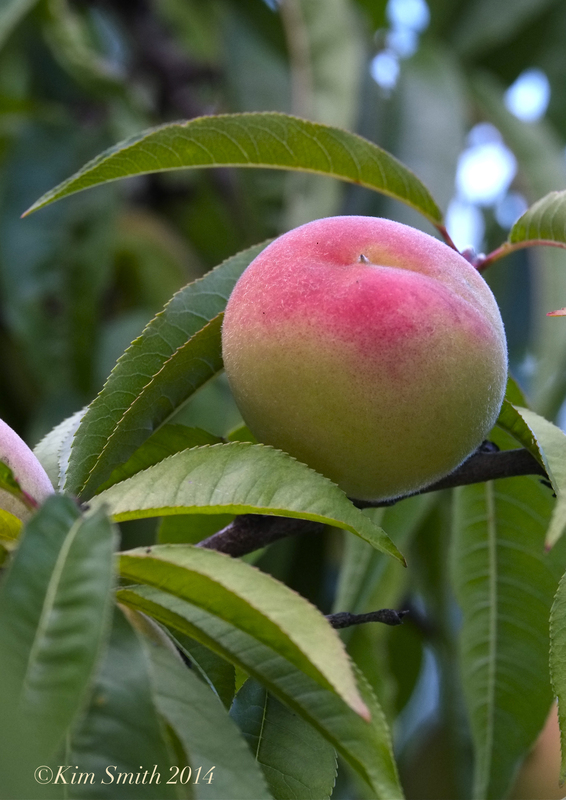 Each and every year since first planting, this semi-dwarf peach tree gives us mouth-watering sweet peaches. Not all of the peaches are perfect and the ones that are not eaten out of hand are whipped into smoothies, cooked in confections, or macerated with Prosecco. Marinate peeled, pitted, and sliced (halved or quartered) peaches in Prosecco for several hours. Just before serving, puree the peach-Prosecco mixture. 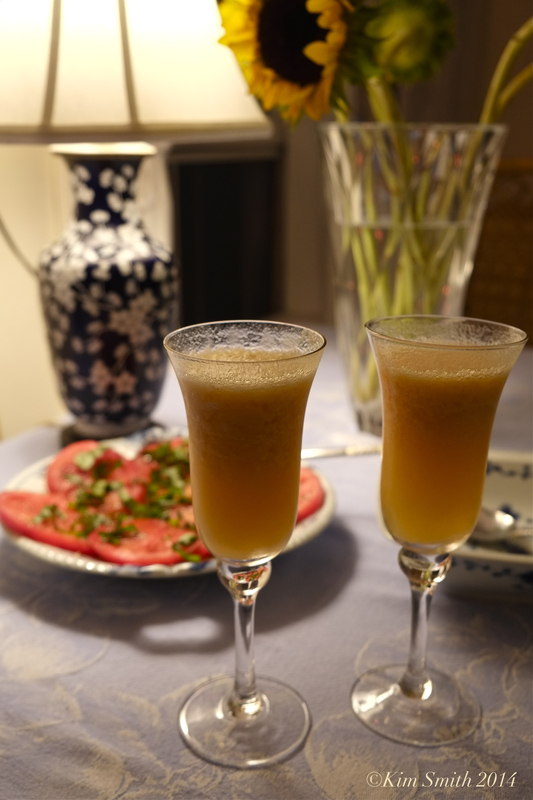 Spoon the puree into champagne glasses, about 1/3 to 1/2 filled, and to taste. Gently add more Prosecco to the puree. Add a drop of raspberry liquor, Chambord, or a few fresh raspberries to the puree, to give the drink that beautiful pinky-peach glow. Bellinis are traditionally made with white-flesh peaches such as ‘Belle of Georgia,’ but any variety of sweet peach will do. 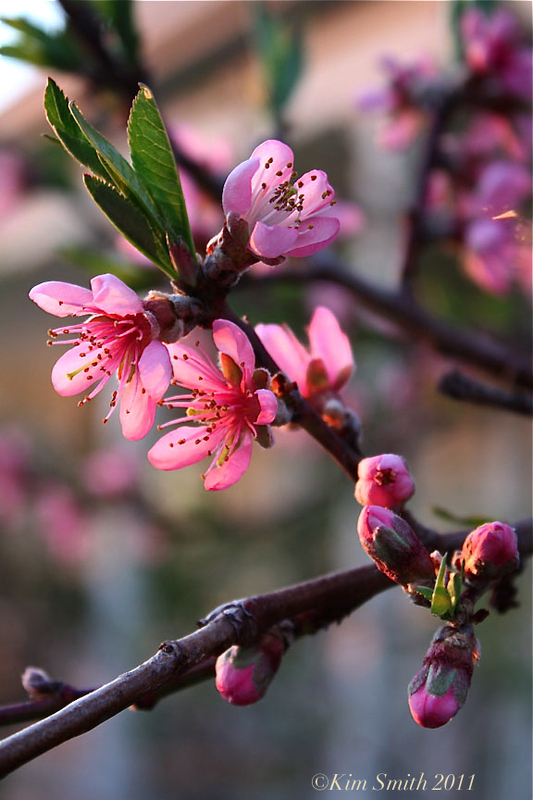 Cultivated by the Chinese for thousands of years, the peach tree is grown for its fruit as well as for its exquisite flowers and gracefully shaped branches. To better understand the significance of the peach tree in the Chinese culture it is worth noting that the development of the Chinese garden with its ying-yang symbolism was essentially Daoist in origin. Daoist believe the peach tree is the Tree of Life at the Center of Paradise. The peach tree is also believed to be the Tree of Immortality growing in a garden guarded by Hsi-wang Mu, the Mother Empress of the West. Men and women alike must meet her standards before they are granted immortality. Hsi-wang Mu is usually portrayed in paintings and sculpture as a stately matriarch holding one of her peaches. The peach tree is a symbol of longevity, wealth, spring, youth, and marriage. Peach stones were considered apotropaic and were beautifully carved and were kept, or worn, as amulets and talismans1. Sprays of blossoming peach branches were at one time placed above the front door to prevent even the strongest evil from entering into the home. Today’s custom is to use them decoratively inside the home. While the Spaniards brought the peach to North America in the 16th century, Native Americans are credited with moving the peach westward, planting seeds as they traveled. ‘Belle of Georgia’ is an older cultivar of peach tree bearing heavenly tasting white-fleshed peaches. The fruit is pale creamy white blushed gold and rose. It was reportedly first propagated by Lewis Rumph in Georgia in the 1870’s from seeds of the ‘Chinese Cling’, which is also the parent of the well known ‘Elberta’ peach, a firm, yellow-fleshed fruit with a crimson blush. Both the ‘Belle of Georgia’ and ‘Elberta’ cultivars are hardy through zone five and adaptable to a variety of soil conditions, though well-drained and sandy soil is their preferred growing medium. This entry was posted in Home and Garden and tagged belle of georgia peach, Bellini cocktail, Bellini recipe, chambord, Oh Garden of Fresh Possibilities!, peach blossom, Prosecco, white peach, white-flesh peach on September 1, 2014 by Kim Smith.